Folk tales from Notts.... or is it Sussex? Stories surrounding the 'Wise Men' of Gotham are legion in local folklore, and perhaps visitors to this site will know of some they can add to this page. What follows, however, is one version of the story behind the legend, as recorded by Everard L. Guilford in his little book simply entitled Nottinghamshire, published in 1910. 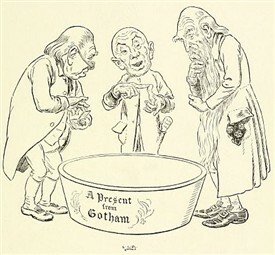 "Gotham has more than a passing interest.... for here is the locale of an extremely interesting group of folk tales, which deserve more expert examination than they have hitherto received. "Everyone will be familiar with the Merry Tales of Gotham, and know how the inhabitants of that village tried to make a hedge round a cuckoo that it might sing to them for ever. "This and many other foolish tales were first written down by Andrew Boord, a merry-andrew of the 16th cent. who came from Sussex. "The three facts that there is a Gotham, a manor house, in Sussex, that Boord owned land thereabouts, and that the sea is mentioned in one or more the stories, have led to the theory that these stories belong to Sussex. "There can be little doubt, however, that Notts has a right to these stories. A traditional Cuckoo Hill is still shown, an not far away was the meeting-place of the Hundred of Rushcliffe." This page was added by Website Administrator on 15/01/2013.